NOVEMBER 29, 2018 – Darkness greets us at dawn in December. The morning winds begin, the trees sway, the leaves poke through the snow and ice and we carry on, adjusting – ignoring the chilly gusts that seem to whisper something new each morning. There is much to ponder in winter’s glare and shadows. We can’t do much without light, and the gray sky that appears in November and often lasts until April sometimes feels like a steel trap. Where is the light, we wonder? The question will linger through the winter, but is never quite answered. But for eight nights in December, the light finds us after sunset. It’s in our homes, our shuls, in public displays in malls, and stores, and even on City Hall lawns. 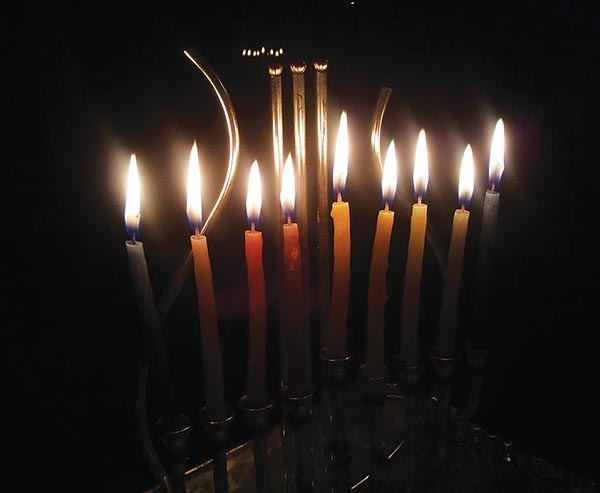 The menorah, which is rarely discussed throughout the year, suddenly takes center stage during Hanukkah. We light the candles, say the blessings, and then stop and stare at the tiny flames. If we take a moment, and silence our cellphones, and iPads, the moment can be powerful. The light can seemingly transport us anywhere our soul desires. In the quiet of the darkness, the light brings us hope. It is a modest set of flames. And sometimes when we stare, another miracle can occur. If we stop talking for a few minutes, and look at the light long enough, our thoughts can cease – at least for a second or two. At that point, we’re left with an inexplicable, otherworldly feeling. If we hold onto it, perhaps the light can continue on the darkest winter days.